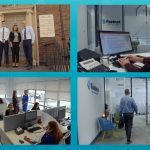 VIDEOZOOM have been commissioned by Bon Secours Hospital Cork to produce a series of videos to communicate more effectively with General Practitioners in the Munster area. The videos are designed to be embedded in the hospital’s monthly ezine publication. The videos are shot on location at Bon Secours Hospital Cork with a green-screen backdrop and professional autocue system. Video is helping hospitals to become better storytellers and create emotional connections with patients, which ultimately, helps drive patient engagement. Hospitals have used video to provide service information, promote their brands, educate patients, provide virtual tours of their facilities and provide real-time and edited documentation of surgeries and procedures. Video has the potential to forever change the way hospitals communicate with their patients and colleagues. However, to be effective, hospital marketers need to have clear goals so they can find the video format that is right for them. VIDEOZOOM have the experience to help healthcare professionals to communicate effectively with video. We have produced video for healthcare for Ireland Aid, GTZ and SOS Children’s Villages and we have worked closely with the Oxford Institute of Biomedical Engineering to provide hands-on video production workshops for researchers. We are also producing a series of tutorial videos for the Dept of Urogynecology, Cork University Maternity Hospital for a brand new online training resource, stay tuned for an update!